Harmful bacteria are a common cause for foodborne illnesses. Whether or not a harmful bacterium causes an illness depends – as with chemicals – on the amount ingested. Therefore, maximum tolerable levels for various types of bacteria in different foodstuffs have been laid down by EU law. For instance, this law prescribes that Ready-To- Eat (RTE) food should – at the moment of consumption – contain an ‘acceptable level’ of microorganisms of concern. One of the microorganisms of concern is Listeria monocytogenes (Listeria). This bacterium is a foodborne pathogen responsible for listeriosis, an increasingly fatal disease. According to the law, the maximum tolerable level of Listeria that is allowed in RTE food is 100 living cells (i.e. ‘colony forming units’) per gram of food. Higher numbers cause an ‘unacceptable’ level, which comes down to microbial ‘contamination’ of the food. In order to prevent microbial contamination in general, the EU laid down strict hygiene rules for food production and for traceability of the final food. However, well-documented practice shows that even the strict hygiene rules are insufficient to avoid contamination of initially safe foodstuffs, while the traceability rule only enables the removal of contaminated products from the market after the problem has already emerged. A clear example of food contamination which cannot be totally eliminated, despite strict hygienic measures, is the contamination with Listeria. This is illustrated by the fact that there has been a statistically significant increase in the number of listeriosis cases between 2008 and 2016, leading to alarming rates of fatalities and industrial recalls. RTE foodstuffs are amongst those that are regularly contaminated with Listeria. Even when the RTE foodstuff has been produced with the help of pasteurization, incidental Listeria cells from the environment or equipment may settle on the food during the final stages of the production process, such as cutting, slicing and packaging. These cells may subsequently multiply further to an ‘unacceptable’ level (and thus contamination). In order to avoid this, RTE food can be treated with a natural bacteriophage which kills the incidental Listeria cells before any outgrowth to unacceptable levels can occur. Such a bacteriophage, which is present in the product ListexTM P100, works specifically on Listeria cells and poses no risk to human health. As it does not kill other foodborne pathogens, strict hygiene measures nevertheless remain indispensable. The bacteriophages present in ListexTM P100 exert their effect during the final stages of food processing and its use may result in the unintentional presence of residues in the final foodstuff. These natural, harmless residues (amino acids and nucleotides naturally present in foodstuffs) do not have any technological effect on the final product. ListexTMP100 is about preventing a process, not about reversing a process or ‘decontaminating’. With a mortality rate of around 13 %, Listeria monocytogenes accounts for the highest amount of human fatalities compared to other microbial food contaminants. ListexTM P100 provides a method to prevent contamination with this food pathogen, making it possible to decrease the number of listeriosis cases and save lives. 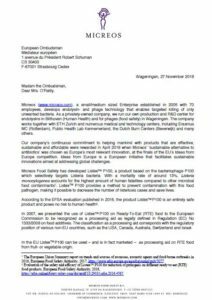 The abovementioned use of ListexTM P100 on RTE food was presented to the European Commission to be recognized as a processing aid as legally defined in Regulation (EC) No 1333/2008 on food additives. The classification as a processing aid corresponds with the regulatory position of various non-EU countries, such as the USA, Canada, Australia, Switzerland and Israel. However, functionaries of DG SANTE proposed and decided that the use of ListexTM P100 on animal-derived RTE food should be authorized as a ‘decontaminant’ according to Article 3(2) of Regulation (EC) No 853/2004 laying down specific hygiene rules for food of animal origin. In the summer of 2017, two years after submission of the authorization dossier, functionaries of DG SANTE decided to publish the Draft Regulation for the authorization on Internet for public consultation. From the 9 responses, 7 supported the authorization while 2 were not supportive towards the classification of Listex P100 as a decontaminant, requesting instead that Listex P100 should be authorized as food additive and labelled on the final foodstuff accordingly. On basis of the two negative responses and the claim that there was not enough support from the Member States, the Commission decided to halt the authorization procedure without making any effort to find a more correct way to legally classify the use of ListexTM P100 on animal-derived RTE food. In view of the increasing listeriosis risks, on 3 July 2018 members of the Standing Committee of Plants, Animals, Food and Feed (SCoPAFF) asked questions related to the option to recognize the use of ListexTM P100 on animal-derived RTE food as a processing aid or food additive, outside the scope of Regulation (EC) No 853/2004. The Chair of the SCoPAFF subsequently concluded that the producer of ListexTM P100 should be requested to clarify how the use of ListexTM P100 on RTE food should be classified. Following this SCoPAFF meeting, DG SANTE did not contact the producer of ListexTM P100 with this request but published in the minutes that the authorization procedure of ListexTM P100 under Regulation (EC) No 853/2004 was halted because of lack of support. In answers to letters from all major Groups of the European Parliament, DG SANTE continued to reject alternative ways to classify the use of ListexTM P100 on animal-derived RTE food, enabling the marketing of this life-saving product. Based on the above facts, Micreos, the producer of ListexTM P100, has decided to approach the Ombudsman to correct this clear case of ‘maladministration’, depriving the European Union of an entirely safe5 product that can help save lives and prevent recalls. Similar to the use of acidulated water on the surface of freshly cut apples to prevent the browning and not to bleach the already brown apple. Click here to read the letter in .PDF format.